A prestigious European Commission RegioStars Award 2014 has been won by the BEACON Biorefining Centre of Excellence, an innovative Welsh research partnership dedicated to developing industrial products from plants to reduce reliance on fossil-based resources such as coal and gas. BEACON is a Welsh Government EU funded collaboration between Aberystwyth, Bangor and Swansea universities. The BEACON team received their award at a glittering awards ceremony in Brussels on March 31st. Researchers at BEACON work with industry, including small and medium sized enterprises, to develop renewable materials, fuels and chemicals as well as modified and new environmental and economically sustainable processes. Led by Aberystwyth University’s Institute of Biological, Environmental and Rural Sciences (IBERS), BEACON was one of 4 projects to be shortlisted in the “Sustainable growth: Green growth and jobs through Bio-economy” category. The other three were Ecoponto em casa from Portugal, ORGANEXT from Belgium, Germany and the Netherlands and ARBOR which has partners from the UK, Ireland, Germany, Luxembourg, Netherlands and Belgium. The Regio Stars awards have been organised by the European Commission since 2008 with the objective of identifying good practices in regional development and highlight original and innovative projects which could be attractive and inspiring to other regions. The RegioStars Awards Jury singled out 19 finalists from 80 projects supported by European Union Cohesion Policy funds on the basis of four key criteria: innovation, impact, sustainability and partnership. The finalists came from regions and cities in 17 Member States: Belgium, Czech Republic, Denmark, France, Germany, Greece, Hungary, Italy, Ireland, Luxemburg, the Netherlands, Poland, Portugal, Romania, Spain, Sweden, and the United Kingdom. 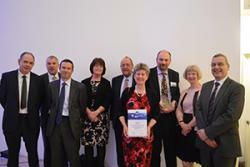 Professor Iain Donnison, Director of BEACON said; “We are delighted to have won the RegioStars Award. This is international recognition of the importance of the innovative work being done by BEACON. BEACON is funded by the European Regional Development Fund (ERDF) through the Welsh Government, under the Convergence programme for West Wales and the Valleys. The full list of winners and further information about RegioStars Awards is available online at: http://ec.europa.eu/regional_policy/projects/regiostars/regiostars_en.cfm.